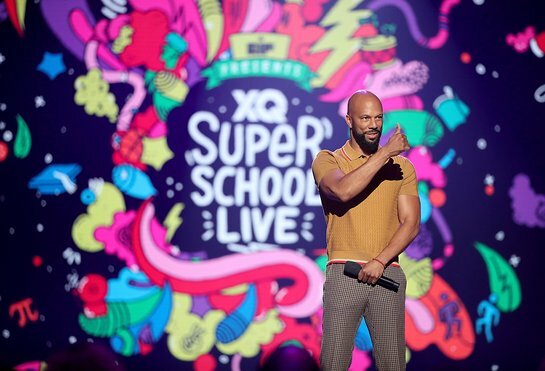 On Saturday, the biggest names in entertainment, journalism, sports, and music joined educators, parents, and more for “EIF Presents: XQ Super School Live,” a one-hour telecast and multi-platform event that invited the public to help rethink the future of American high schools. The event was produced by Done + Dusted, executive-produced by Viola Davis, Julius Tennon, and XQ Institute, and directed by Hamish Hamilton. The all-star telecast aired live from Barker Hangar at the Santa Monica Barker Hangar on all four major U.S. networks – ABC, CBS, FOX and NBC – on Friday, Sept. 8 at 8:00-9:00 PM ET live/PT tape-delayed. The telecast is also available on-demand on ABC, CBS, NBC, and FOX’s streaming platforms, as well as Hulu and YouTube. Dance star and social media influencer Dytto, and actor Jorge Diaz hosted a pre-show that streamed live on Facebook, Twitter and YouTube. The telecast hashtag — #XQLive — trended worldwide on Twitter throughout the show. •	Lin-Manuel Miranda visited his old high school and his high school theatre teacher, Gina McCort. They reminisced about his days in theatre class and took a trip down memory lane showing home videos of him performing in his very first onstage musicals.